If the mere words “European fashion” seem a bit off-putting or intimidating, hold onto your golf hat and relax, because you may be missing out on one of Hilton Head Island’s most exciting shopping opportunities. Located on the corner to the right of the Neptune statue at Shelter Cove Harbour, Taffeta is an exquisite boutique that brings a bit of Parisian élan to our casual island paradise. No, this is not where you will buy your T-shirts, shorts and flip flops. But it might just become your go-to source for looking and feeling good when you’re not knocking around in your sports attire. Whether you are the prissy girl or the practical woman, it’s a place where you can discover your personal style, establish a unique look, experiment with new and different fashions, or simply enhance your current wardrobe with unusual accessories and shoes. Besides a distinctive look, Taffeta customers know that they can count on personalized customer service. Staff members get to know your style and taste and keep you updated on new merchandise, especially if an item comes in that “has your name on it,” so to speak. If you live elsewhere, they are happy to send a selection of clothes and accessories to try on approval. In-store assistance is accommodating, not overbearing. No one at Taffeta wants you to walk away with something you don’t absolutely love, and they certainly won’t sell you an item that isn’t a good fit. That’s not to say that you won’t be encouraged to think outside of the box. 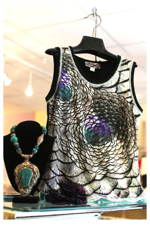 When you shop at Taffeta, don’t expect to see yourself around town or across the room. Taffeta offers a limited number of the same item—sometimes only one and rarely more than one in each size—making it unlikely that you will ever run into another woman in your exact outfit or even the same skirt or top. Sizes range from U.S. 4-16, and the sales staff will help you translate the European sizing. Along with exclusivity, a certain timelessness pervades. Quality fabrics and workmanship elevate the clothing beyond today’s passing trends and make for lasting style. “Customers tell us that they still wear and love things they bought here 10 years ago,” Hunt said. Prior to taking the reins at Taffeta, Hunt worked in gardens alongside an amazing designer who taught her about flowers. She went on to teach art for three years at an at-risk boarding school for teenage girls. 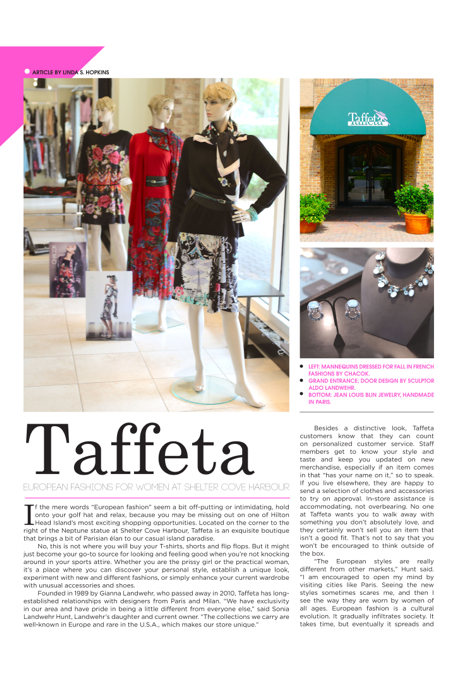 Taffeta is located at 17 Harbourside Lane, Hilton Head. For more information, call (843) 842-6767.